A strange little movie but it was still entertaining. Cyrus Zorba is a scientist with money problems. The furniture in his family's house has been repossessed and they have no money to catch up on their bills. Cy's uncle has passed away and left his house to Cy. He and the family are very excited. Cy moves in with his wife, Hilda, daughter, Madea, and son, Buck. They meet the uncle's lawyer, Ben Rush, who tells them the story of the house. 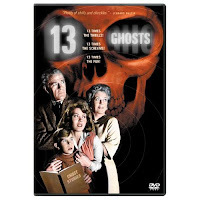 It seems that it is haunted by 13 ghosts. The uncle was also a scientist who invented a pair of glasses that allow people to see into the supernatural world. The family soon learns from the maid, Elaine (Margaret Hamilton aka the Wicked Witch of the West), that their uncle had converted all his investments to cash the day before he died but no one ever found the money. Now Ben wants Buck to help him find the treasure before the ghosts hurt the family. This was not the greatest movie ever made but it was fun and mindless entertainment. The acting was a little over the top but that is part of what made the movie fun. There was a remake made in 2001 starring Tony Shalhoub. If you like old cheesy horror movies than this one is for you.